This Saturday, thousands of us will be taking part in March for Our Lives, in D.C. and other cities across the country, to support students and families who want an end to gun violence. The Parkland students—and others who’ve been organizing against violence in their communities for years—are asking us to stop accepting business as usual when it comes to gun violence. That means holding lawmakers accountable. It also means doing everything we can to unseat Republicans who cater to the NRA. If you’re planning to march, too, check out these resources we made for you—including flyers to hand out, banners, and signs you can print at home or at a shop. 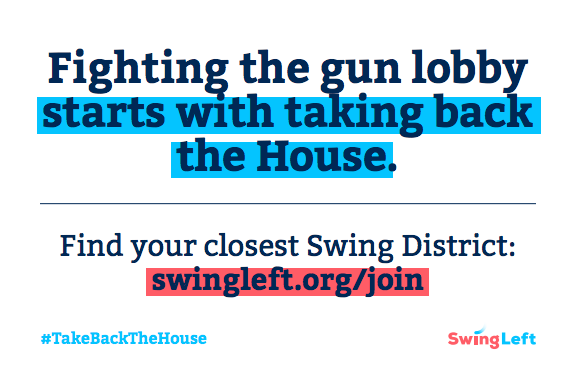 Spread the word that fighting the gun lobby starts with taking back the House. And even if you’re not marching, you can still help—by making a donation to a special fund dedicated to defeating the 30 Swing District Republicans in the House who took money from the NRA last year. March for Our Lives is a massive mobilization effort, with 800 marches planned around the country (you can find your closest one here. It’s incredible to see so many students asking the world to step up and help them achieve their goals. Let’s join them.